Complete this tutorial to use the Pega 7 Platform text mining capabilities to analyze the text data that is posted on Facebook, Twitter, and YouTube social media platforms. These platforms contain various types of unstructured data in the form of status messages, posts, comments, and so on. By analyzing this data, you can structure it and derive usable business information to deliver better services to customers and increase your customer base. For example, by tracking and analyzing tweets about your organization or your products, you can discover whether the customer response to the release of one of your products was positive or negative. This type of knowledge can help you quickly detect, respond to, and address your customers' needs and issues and, in consequence, retain and grow your customer base. Sentiment analysis – Detect and analyze the feelings (attitudes, emotions, opinions) that characterize a unit of text, for example, to find out whether a product review was positive or negative. Knowledge about customers' sentiments can be very important because customers often share their opinions, reactions, and attitudes toward products and services in social media. Additionally, customers are often influenced by opinions of others that they find online when they make buying decisions. Classification analysis – Assign one or more classes or categories to a text sample to make it easier to manage and sort. Classification analysis can help businesses improve the effectiveness of their customer support services. By classifying customer queries into various categories, the relevant information can be accessed more quickly, which increases the speed of customer support response times. The NLP Sample application showcases the text analytics capabilities of the Pega 7 Platform. This application is available as an archive file that you can download and install. The application includes a portal, sample text analyzer with text samples, taxonomies, and lexicons that you can explore or extend. For more information, see Exploring text analytics with the NLP Sample application. One of the most important tasks in establishing the infrastructure for text analytics is connecting your application with Facebook, Twitter, or YouTube API through Data Set rules. Each social media platform that you can mine for text data has a corresponding data set type in your application. Before you can connect your application with Facebook, Twitter or YouTube, you must register your application to obtain authentication credentials. 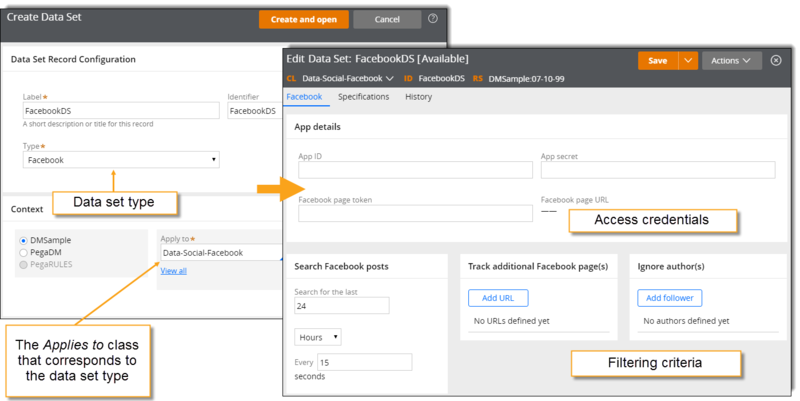 For Twitter and Facebook data sets, you can customize the metadata types to retrieve through the Social Media Metadata landing page. By adding custom queries in the Pega 7 Platform, you can configure your Facebook social media connector to retrieve only the metadata that you select, for example, user verification information, profile pictures, icons, and so on. In the Records Explorer, expand the Decision list. Right-click Text Analyzer and click + Create. 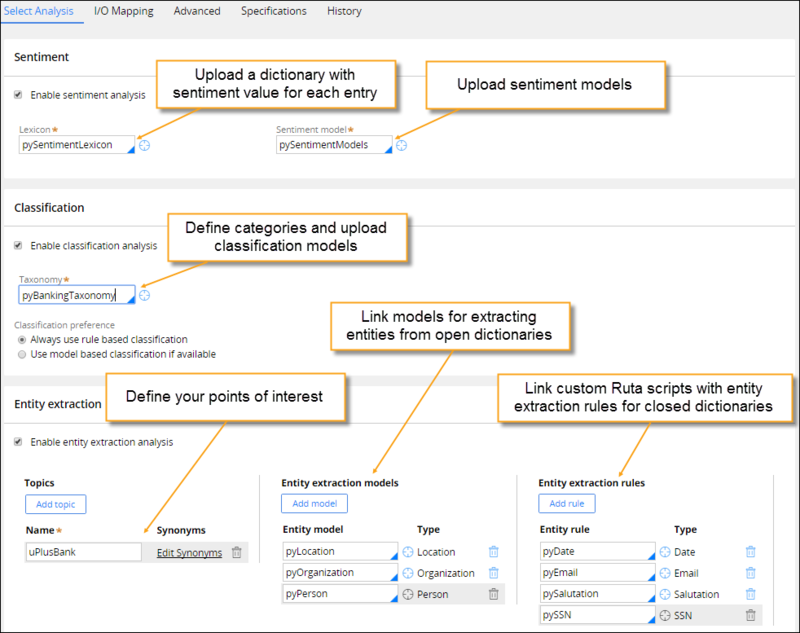 Configure sentiment analysis – Define the sentiment lexicons and models to use for opinion mining. Use the Text Analytics landing page to create and train custom models for sentiment and classification analysis. Through a four-step wizard, you define the type of the model and the training algorithm, upload training and testing data, train the model, and review its accuracy. You can use the models (as decision data binary files) in text analysis. You can also export the models. Configure the language settings – Control how your application detects the language of the text data. For example, you can specify that the language is detected by your application or by the provider of the text data (for Twitter only). Configure spelling checker – Enable the spelling checker to increase the confidence score of the data that you categorize (that is, the data is categorized more accurately). After you create and configure a social media data set that tracks the relevant data, and you configure a Text Analyzer rule to process and structure that data, you must create a Data Flow rule. Minimally, this data flow must reference a social media data set as the source, a text analyzer to process the extracted text data, and a destination. The destination of the data flow can be an activity that writes the data flow results to a database. In the Records Explorer, expand the Data Model list. Right-click Data Flow and click + Create. The Applies To class of the Data Set and Data Flow rules must be the same. From the Data set list, select a social media data set and click Submit. Click the connector that radiates from the Source shape and select Text Analyzer from the list. You can enrich your data flow with additional shapes, depending on your business objective. For example, if you analyze Twitter data, you can add a Filter shape between the Source and Text Analyzer shapes with .pyKloutScore >= 70 condition, to analyze only tweets from the most influential members of the audience.